Tourism is currently one of the largest industries in Savannah. It provides 26,000+ jobs, $2.5 billion in visitor spending and economic opportunities for residents, and highlights to the world the positive attributes of what makes our community so unique. Savannah must remain vigilant that the growing number of visitors does not detract from the community’s authenticity or negatively impact the overall quality of life of historic district residents. Careful planning and management are necessary—especially looking into the future. 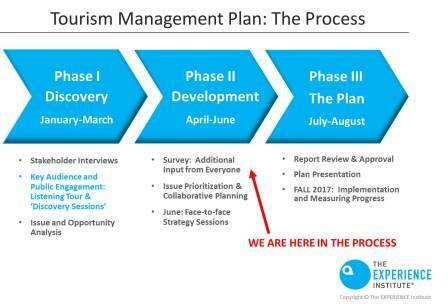 In late 2016, the City engaged The EXPERIENCE Institute® (TEI) to develop a tourism management plan with the goal of balancing resident needs with industry interests, while also maintaining Savannah’s prominence as a global visitor destination. The Tourism Management Plan (TMP) represents a unique partnership with the Downtown Neighborhood Association, Visit Savannah and Historic Savannah Foundation who each contributed $5,000 while the Tourism Leadership Council provided $1,500. The City provided $16,900 to the project and secured a $10,000 competitive grant from the National Trust for Historic Preservation’s Johanna Favrot Fund for Historic Preservation.